NEW ACADEMY president Cheryl Boone Isaacs. Cheryl Boone Isaacs is as excited about movies today as when she was allowed to stay up late as a girl in Massachusetts to watch the Academy Awards. Only now the Irving Blvd. resident is working with the producers on next year’s Oscars. And, she is going over the fine points with Academy chief executive Dawn Hudson on a “world-class” movie museum planned at the historic May Co.
Isaacs was elected president of the Academy of Motion Picture Arts and Sciences in July by its board of governors. “That was a great first week. I’m very happy that Ellen (DeGeneres) is our host (of next year’s Academy Awards)… we’re off to a wonderful start,” she said last month from her city-view office on the top floor of the Academy’s Beverly Hills Wilshire Blvd. office. She works with staff, runs the day-to-day operations and oversees the Academy’s 6,000 members who make movies around the world. Isaacs graduated from Whittier College with a political science degree, which may have actually prepared her for the movie business. “Anytime there’s more than three people in a room, it’s political,” she said. “What a way to start!” she beams. Cheryl worked with journalists from interns to pros, all the while following her motto to work hard, keep her head down and look up in 10 years to see where she was. 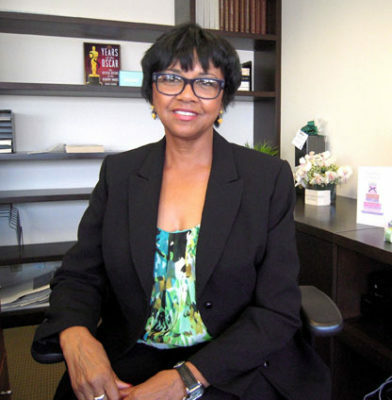 She’s been a member of the Academy since 1987, and held every post from secretary to president, and she was on the board of governors for two decades. She remembers shopping at the May Co. long before it was targeted for the Academy’s new museum. A funding campaign is halfway to its $300 million goal for the Renzo Piano-Zoltan Pali design. Plans call to break ground next year and open in 2017. She settled in Windsor Square 17 years ago, first on Lucerne Blvd., and moved to Irving Blvd. five years ago. The neighborhood’s trees are a big attraction, says the self-avowed lover of redwoods and other varieties. The art of film and the advances in technology that enable an audience to sit in a dark room and have a shared experience that is transformative never ceases to amaze her. “I am in awe,” she says. She aims to include more of the creative and scientific best of the best, and diversify with more women and minorities among the Academy’s members. She may be too busy in her one-year post (she is eligible for reelection) to devote much time to her marketing consultant work—her latest film was “The Call” with Halle Berry. But there will always be time for movies.